O.K., I'll admit it: I've never been much of a seashore guy. Oh, sure, I used to take the occasional visit to the Jersey Shore with my family when I was a kid. But ever since my then-girlfriend (and now wife of 26 years) suffered a debilitating sunburn at Seaside Park way back in 1982, we haven't been back since. It's just as well, for two main reasons: 1) I never really got much of a kick getting sand in my sneakers and swim trunks and 2) I've always been much more of a mountain person. These days, one would be hard put to find a single liquor store anywhere in America that doesn't stock the pale straw-colored lager of Adolph Coors. However, younger beer chuggers may not be aware that this was not always the case. 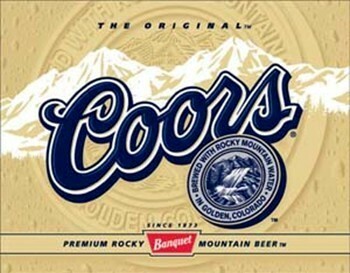 When I began my beer adventures back as a young lad, Coors was only available west of the Mississippi River. It is for this reason that my first experience with the pride of Golden did not occur until my wife and I made an auto trip out west back in 1985. After a visit to the Grand Canyon for a few days, we journeyed up to the stunningly beautiful resort town of Estes Park, Colorado. Estes Park sits on the edge of Rocky Mountain National Park, which boasts one of the highest continuous auto roads anywhere in the world. However, even the town itself is a full mile and a half above sea level. It was here that I first discovered the clean, simple pleasure of Coors Banquet Beer. Like several big-market American brews, Coors derives its delicate character from an almost equal proportion of barley malt and rice, resulting in a crispness of flavor that is teased by just a faint hint of maltiness. There is just enough hop to compliment the subtle malt, making for an easy sessionable brew that lends itself to imbibing in quantity. This easy “drinkability” quickly got the better of me, since I was unaccustomed to quaffing a six-pack at an elevation of 7,500 feet. Life in general gets a little strange at these altitudes. For one, water boils at a lower temperature, requiring adjustments to be made in food preparation. Second, since the outside air pressure is lower, the contrasting gas pressure on the inside of one's body will increase, possibly resulting in some embarrassing intestinal reactions. Third, due to the lower amount of oxygen reaching your bloodstream, the intoxicating effects of alcohol are greatly magnified. Unfortunately, I found this out the hard way, and I was consigned to the bed somewhat earlier that evening so that I would be sufficiently recovered for the following day's activities. It is so tempting to want to go on and on about the glorious beauty of the mountains of the western United States that it is not difficult to overlook the peaks that reside back here in the eastern part of the country. For sure, the eastern mountains cannot compete with their western counterparts for sheer height. For example, the east's highest peak, Mount Mitchell in the Black Mountains of western North Carolina, rises a mere 6,684 feet in elevation, which is actually lower than standing on the rim of the Grand Canyon. However, the views can, in their own way, still be equally breathtaking, and in some cases, the ascents of these mountains can be equally as dangerous. No where is this combination of scenic beauty and peril more apparent than on Mount Washington in northern New Hampshire. 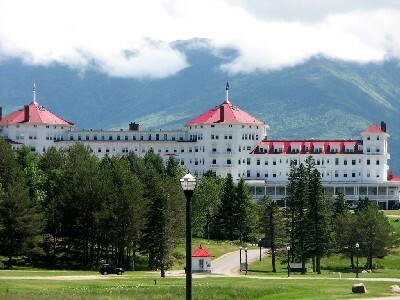 At 6,288 feet, Mount Washington is the highest peak in the northeastern United States. Because of its close proximity to the eastern megalopolis, it is one of the most visited mountains in America. People can drive an auto road to its windy summit, which until recently claimed the title to the highest straight-line surface wind speed ever recorded on earth - 231 miles per hour (sadly, this record was broken by a typhoon in Australia in 1996). As a result, one must take care hiking this mountain - its potential extreme cold and sudden changes in weather have claimed over 100 lives. Over the years, my wife and I made frequent trips to this mountain, which on clear days (somewhat rare) you can see as far as the Adirondack Mountains in New York, over 130 miles away. It was on these trips that I came to try and enjoy the delicious Geary's Ale of Portland, Maine. Geary's is a copper-amber pale ale of conventional strength, and is brewed to tastefully mimic classic British pale ales. It is generously hopped, but not to the tongue-puckering extremes that can be found in some west coast ales. It features a delightful gentle fruitiness, and it makes for a wonderful session of darts in a pub on a Saturday afternoon, or for a few bottles to throw back as refreshment after coming off the mountain. It recalls the great New England patriot Ethan Allen of the famous Green Mountain boys, who once carried a barrel of beer up Mount Washington so that he would have something to party with once he reached the summit. It was twenty years ago this month that I actually had the opportunity to hike Mount Washington myself - perhaps the last great athletic achievement of my life before I allowed myself to slip into portly middle-aged spread. I would be amiss if I did not make an R.I.P. tribute here. The day after I hiked the peak I drove over a hundred miles out of my way so that I could pay a visit to the late, great Catamount Brewery of White River Junction, Vermont. 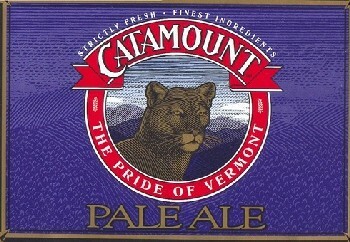 Catamount was founded all the way back in the 1980's and was thus one of the great pioneers of the American craft brewing movement. At the brewery, I picked up two cases of Catamount Gold (an extremely fine example of the eastern Golden American style of ale) and then proceeded to smuggle it home. Unfortunately, this small fledgling brewer, which featured a likeness of a Vermont mountain lion on its label, did not survive the bills it incurred when it attempted to expand its production and its distribution into other markets. This should serve as a simple reminder of caution to microbrewers to go easy when trying to branch out their operations. Sometimes it's best just to keep things right at home. After all, if the beer is good enough people should be willing to climb mountains just to get their hands on it!